“How To Relieve Pain From Gout” is the first project in GoutPal’s personal gout support service. I am indebted to Graeme Austin for volunteering to test drive GoutPal Membership, AKA How To Treat Gout. This project page summarizes public and private correspondence. GoutPal is run solely by Keith Taylor. I acknowledge that my volumes of gout information can make decision making difficult. I hope this personal support service will help me make my gout guidelines clearer. What I’m looking for from either GoutPal or you Keith is some simple and concise gout pain management/treatment information that I can put into place, without having to read volumes of material to make a decision… and I’d much prefer to use natural remedies or supplements to do this, however I’m not sure if any of these natural options work fast enough or work at all. What can I expect from Gout Relief? If I were in an acute gout attack mode now… what would be the best solution to rapidly reduce my pain within a few hours? I will raise the priority of completing my Directory Of Products for Treating Gout. This will make it easier for gout patients to choose treatments that suit their personal situation. Between gout drugs, herbs for gout, and non-medicine ways to relieve gout, I prefer pharmaceutical or non-medicine. I will add some comments about ways to avoid problems with colchicine. I was prescribed Colchicine way back in 2003/4 and it upset my stomach and bowels big time. I just did not want to take that drug, so I didn’t. So, I suffered the attacks as best I could using natural therapies. I felt there must be a better solution out there, but after 10 years to my astonishment, nothing much has changed. I battled through my first acute attack this year over a 3 week period, but when I got the second acute attack only a month later, I simply couldn’t endure the pain anymore, so I resorted to the drugs described below. I will use the comments to ask about other choices for gout pain remedies if I think it is relevant to helping my pain management plan. I will add some comments about steroids (e.g. Prednisolone) and also some comments about how long you should wait before starting allopurinol or other uric acid treatment. I was given Prednisolone for 2 weeks, which has now passed and I now take a Colchicine twice daily [1 in the morning and 1 in the evening]. I also have 1 Arcoxia (anti-inflammatory) each day. This will continue for 2 more weeks, then I drop the Colchicine and take Allopurinol with the Arcoxia. I will use the comments to discuss how my chosen gout treatments have cured my gout pain symptoms. GoutPal will summarize my progress here, replacing comments as appropriate. All gout pain relief should be a temporary measure until safe uric acid levels are achieved. My new project to help Graeme learn how to prevent gout attacks is coming soon. I have summarized public comments and private correspondence to prepare the text above on Graeme’s behalf. Any inaccuracies are entirely down to me, and I would ask that Graeme notes any changes required in the comments below, by private message, or in the “burning questions” box in the GoutPal Membership profile. Graeme and I will add comments below in order to allow Graeme to be confident he can control acute gout attacks. Where possible, comments and questions should be separated so that each comment covers a single point. As of 2016, I’ve integrated Personal Gout Management Plans with the new gout forum. Colchicine is very effective against gout pain, if it is taken early enough. It works by interrupting the basic processes of life – cell division. When inflammation starts, there are a few hours of intense activity as your immune system reacts to invading uric acid crystals. White blood cells (specifically phagocytes) need to grow and divide to meet the demand, a process know as phagocytosis, a type of inflammation. Colchicine strangles this process, but it also slows normal cell division throughout the body. Therefore, it is vital to avoid excess colchicine (no more than 2 tablets per day), and to avoid taking it if you are suffering from any form of infection. It is pointless taking it once the main attack has started to subside, though there is an argument for taking one or two tablets as a preventative. Taking colchicine as a preventative used to be seen as an alternative to taking uric acid lowering meds, such as allopurinol. This is now frowned upon, as investigations have revealed that joint damage starts to occur even before we recognize a gout flare. Rheumatologists now recommend that colchicine is only taken as a preventative during, or just before, allopurinol, or other uric acid lowering treatment. In fact, the latest research (https://www.goutpal.com/4853/start-allopurinol-quickly-but-carefully/) indicates that there is no point delaying the start of allopurinol, as long as you have a plan for dealing with acute gout pain. 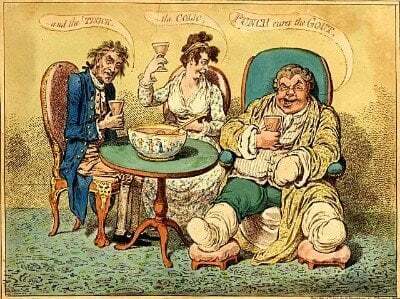 I am working on two simple gout treatment plans to supplement the rather long-winded plans in my current guidelines. I will incorporate these colchicine facts into those treatment plans. One simple plan will be for dealing with acute gout attacks, the other simple plan will be for preventing future attacks. This information on Colchicine and Prednisolone is very good… I’m particularly interested in the comments in your last paragraph relating to Colchicine about the two simple plans you have in mind that incorporate dealing with acute attacks and the ongoing prevention method plan. Thanks Graeme. My two plans are: Acute Gout Attack Treatment Plan; and Simple Gout Attack Prevention Plan. Prednisolone is a steroid that is very effective at reducing inflammation. It also suppresses the immune system, so it can be seen as an alternative to the NSAID & colchicine combination that I usually suggest. Personally, I am very concerned about the use of steroids in gout due to their bone-weakening (osteoporosis) effect. This might be a small risk, and has to be balanced against the debilitating agony of an acute gout attack. I recommend that all gout sufferers should discuss the osteoporosis risk on gout-weakened joints with their doctor before accepting a prescription for steroids. Apart from it’s toxicity, the main problem with colchicine is that it is not a pain killer. I used it very effectively during the first few weeks of allopurinol treatment as a preventative. I then kept it on hand for a few months until the gout attacks stopped completely. I only had occasion to use it “as required” a few times. It worked if I caught the attack soon enough, but I usually took a couple of ibuprofen at the same time. When I was hospitalized with gout (because nobody seemed to know what my swollen ankle was! ), I learned the trick of alternating ibuprofen with paracetamol (Tylenol). This has always been very effective for me. I know that oral steroids are very effective at controlling gout pain, but I know people who have had very bad reactions, so I stay away. I’ve also heard that a steroid shot, rather than pills, is very effective, but again, not for me. People react differently to different pain killers. Even different NSAIDs seem to affect people differently. For instance, I can take ibuprofen without problems, but it makes other people sick. Over the years, people on the forum have often discussed how finding what works for you can take time. I’ve also heard that pharmacists are often better placed to suggest different choices, and they tend to know the latest, most effective pain meds.